We first told you about Griffin’s StudioConnect audio interface when it unveiled at the Consumer Electronics Show earlier this year. There are more than a few products on the market that make it easy to hook up your guitar, mic, or MIDI controller to the iPad for use with the many iOS apps that include built-in DAWs with CoreMIDI support (such as Apple’s own GarageBand). While it might not be the prettiest iPad dock we have seen, there are a few reasons why it beats the competition. With StudioConnect, in terms of inputs and outputs, what you get is pretty basic: standard 5-pin MIDI in and out, one 1/4-inch mono input, and left and right RCA output. The large knob out front controls the 3.5mm headphone jack below it, while a separate volume wheel on the side is for your main output. It is more than enough to plug in supported mics, a guitar, or a MIDI controller, but it is clear that Griffin did not build the StudioConnect with professionals in mind. Most pros will not do anything too heavy-duty inside of an iOS app at this point. The inputs above will likely be sufficient for most musicians using the iPad as a mobile or writing setup. While it does not offer some of the standard inputs and outputs that pros are familiar with, Griffin used its experience making iOS accessories to nail the design where the competition gets it wrong…. The majority of audio gear manufacturers that produce interfaces with iPad support (such as this one from Tascam) do not provide anywhere to dock the iPad while recording/performing. While the box or rectangle design of traditional audio interfaces work fine on your desk or in a rack-mount, you would need a stand—or something to prop up for a functional workstation— with an iPad setup. As you can see from the images above, Griffin’s interface is designed like a traditional iPad dock. This allows it to double as a decent stand (and 10-watt charging station), even when not taking advantage of its inputs. 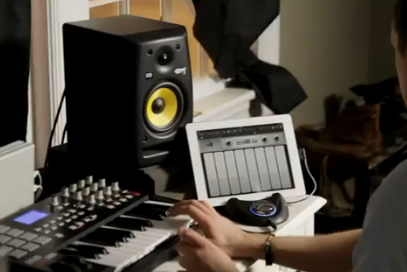 Studio gear manufacturer Alesis makes an interface for iPad called the “iO Dock.” A few benefits of the iO Dock that you will not find in StudioConnect include two combination 1/4-inch-XLR inputs, video output, USB MIDI, a pair of 1/4-inch outputs, and a 1/4-inch headphone jack. Granted, the iO Dock sells for around $50 more than StudioConnect, but only a few of the outputs will be useful at any given time depending on the app/gear you are using. Compared to iO Dock, which holds the iPad in snuggly at a 25-degree angle (ideal for performing), StudioConnect’s dock design is likely a more comfortable position for the majority of players at home. The dock design is also better suited to those who want to easily drop in the iPad and start playing. The iO Dock is designed more like a case (which we know is frustrating to get the iPad in and out of quickly and easily). As for build quality, it is all plastic—except for rubber to protect and hold the iPad. It also has rubber on the bottom for traction, and it is heavy enough that it does not slide around when plugging in heavier gear or performing. If you simply want to plug a 1/4-inch cable into your iPad for a guitar or mic, there are certainly cheaper solutions on the market. However, for a full-on audio interface with level controls, MIDI, and audio out, the StudioConnect’s $149 price tag is either less or on par with all of its competitors mentioned above. We will give away a bunch of products today to 9to5 readers in celebration of Father’s Day, one of which will be a Griffin StudioConnect. You can enter to win here.